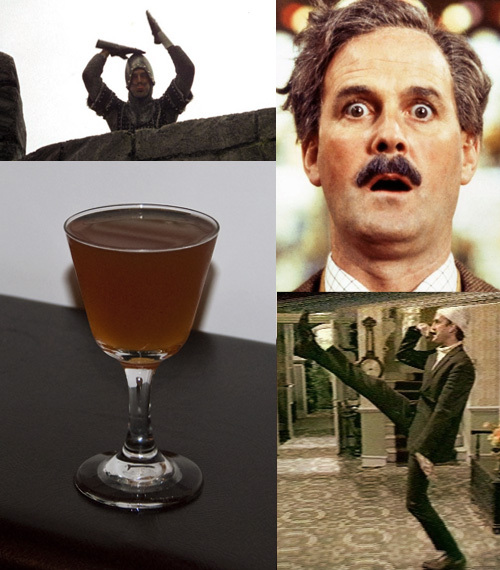 Yesterday was John Cleese’s birthday (along with my daughter’s, as it happens), and so a perfect time to bring out his Spamalot cocktail. Stir and strain into coupe rinsed with peaty Scotch (Laphroaig 10). * For honey syrup, heat equal parts honey and water, reducing slightly. For Mr. Cleese, I went with an international theme. The Cognac is for the French Taunter in Holy Grail, but could equally be for others, like the waiter in Meaning of Life. The vermouth, much needed in this drink to open it up a bit from the other, sweeter elements, must be an Italian dry like Martini. I put this in for A Fish Called Wanda, as his character of Archie is fluent in Italian and uses this (along with Russian) in a hilarious scene with Jamie Lee Curtis. The Jagermeister is German, but DON’T MENTION THE WAR! It adds a sweetness and bit of an anise hint to the drink. More sweetness comes from the honey syrup, a nod to Eric the Half-a-bee. If I could have put a silly walk into the drink I would have done that as well.